The prevalence of chronic kidney disease is a major public health issue in Sri Lanka. 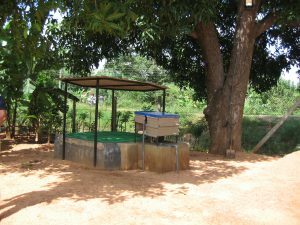 It is a significant issue in the Trincomalee District where the stretch of land from Trincomalee to Anuradhapura contains soil which consists of residue material from farming practices which involve the spraying of glyphosate and which contaminates drinking water. Some 9,000 people in the town of Morawewa have, until this project, acquired their water supply from a canal/well/tube well which is contaminated with pesticides. The project focuses on Morawewa town, some 24km from the centre of Trincomalee. It has involved the installation of a water purification plant inside school premises of Kish pre-school. 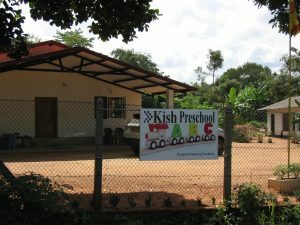 Kish school was completed and opened in 2016 in order to provide free early years education to the young children in the area. It is an initiative of Kumar and Shanthala Sundararaj, set up in memory of Kumar’s parents who lived for many years in the community. This is a community that was decimated by the Sri Lankan civil war which lasted for three decades until 2009. Kumar’s project aims to revitalise the town and provide opportunities for education and employment. The provision of pre-school education and safe, clean drinking water is central to overall plans. The school had an existing water well and the purification system renders the water fit to drink so addressing the chronic kidney disease problem. The water purification project involved the digging out and construction of a much deeper well. This new construction is 150 feet deep and allows purified water to be brought to the surface and accessed through a pipeline by the school and other village people. All 9,000 individuals benefit and it is anticipated that the project will save many lives and suffering from chronic kidney disease. The project is funded by Project Sri Lanka and implemented by the Rotary Club of Colombo Mid-City. All on-going expenses such as electricity and maintenance are borne by Kish School.